This lovely park is Paul's area of the world more than mine but I had a lovely day here today. The first mention of Dunham's deer park was in 1353. 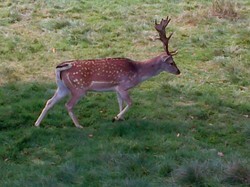 The deer at Dunham Massey Park today are fallow deer and are quite tame around visitors. People were strolling around amongst the deer. The deer park is to the south of the Hall. Dunham Massey Park is owned by the National Trust. The park is largely wooded and has a Hall, a mill, lakes and gardens too. The trees there are of particular significance as many are very old, some being over 300 years old. Interestingly, the park runs along the straight old Roman road from Chester to the York , both major Roman garrison forts. But this was hundreds of years before the de Mascey family developed Dunham Massey. There were 3 Massey castles in the south of the district hundreds of years ago. The tree above is fenced off because it is so old. Look at the girth of the tree trunk. It must be very old. The back and side of the house are behind. The deer have beautiful faces and colouring. They have these speckled backs and are gentle creatures walking around the visitors. The deer are just beautiful, calmly wandering round. Visitors are asked not to go onto their reservation but many deer walk out of it towards the house and visitors, who are very respectful and careful around them. The antlers on these deer were huge for their heads and must have been quite mature. Above, the deer were wandering around in front of the beautiful house in the background which was built in 1616 by Sir George Booth. The latest family to own the hall were descendants of Lady Jane Grey's family. Lady Jane Grey was England's queen who was executed aged approx.15, after 9 days on the throne in Tudor times. Although "wild" other creatures are also relatively well accustomed to having visitors around the park. This swan stayed exactly where it was, sitting by the side of the old moat as I went close to it. Dunham's water mill was built in the 1860's but it was replacing an earlier mill, the first of which was noted in 14th century. The clock tower was built above the stables and has the date 1721 around it, one number in each corner. The house is open to visitors and I especially enjoyed seeing the kitchens, laundry and dairy at the back; the place where the hub-bub of the house went on day in day out. This is a must-visit if you are in the area or indeed NW England. For those interested in visiting the park around Christmas there will eb lots of events. The link is here. The link here is for the otter sanctuary and I took photos of more recent pet tombstones but you get the idea. Hamon de Mascy took the land at the Norman invasion I believe, hence the name Dunham Massey. You are right to see the significance of Dunham's proximity to the Roman road, for it remains a major artery even today, though the original road is deeply buried neath the modern surface. It aims straight at the ford at Stretford [Street Ford] and thence on to the Roman fort at Manchester. The Dunham locals would have used the Roman road to send goods to either Chester or Manchester markets. The estate would have developed where it was because of the road. As an estate Dunham Massey antedates the Normans, who dispossessed a Saxon than of it during the reign of William the Conqueror. I suspect, like me, you enjoy taking interesting photographs to share. It is interesting to see views of Dunham Massey because, many moons ago I wrote a book Animal Graves and Memorials which featured local dogs "Poor Cato," "Poor Tipler" and "Poor Turpin," 18th century dogs buried in the grounds. I have added a Christmas events link for those who are interested or able to visit Dunham Massey over the festive period. When we were in Norway the locals warned us of driving the mountains at night, as collisions with an elk in the dark are often fatal, but elk are far larger and heavier than fallow deer are. There are warning signs on some English roads about the presence of deer running across the road. I haven't heard of it in England though. I have heard comments in American films about cars colliding with deer but I haven't encountered it here before. Colliding with a deer has been fatal for drivers in some instances. But only tractors operated by National Trust workers can get into the park, so both humans and deer are safe. Oh my goodness. That sounds dangerous. These are all securely in an enclosed park and there are no cars driving around. It is all gated but I can imagine colliding with a deer whilst driving would be startling. Thanks for your photo comment. Would the Tudor idea of Christmas food suit our modern tastes ? The Tudor Christmas fayre was different from the modern Christmas. This week we had a family day out to the ruins of Beeston Castle, West Cheshire, close to England's border with Wales. Delightful.